Due to the small size of passenger vehicles and the presence of numerous flammable fluids and materials within every operating motor vehicle, it can be very difficult to determine the cause of a vehicle fire. A vehicle fire is similar to a fire set in a barrel. Although a fire may initially be contained in the engine compartment, the presence of holes through which wires and cables extend into the passenger compartment, creating an avenue. Fires quickly expand to encompass most or all of the vehicle, and major damage is likely to occur within fifteen minutes. through which a fire may travel. Most cars will burn completely in less than an hour. Modern vehicles are built to be lighter, but the plastic and fiberglass components that lighten the load will also burn in a fire. The most common accidental cause of a vehicle fire is a fuel system leak. When a fault in a fuel line, fuel injector or, in an older car, a carburetor, allows gasoline to escape, a fire becomes very likely. The flash point of gasoline, the temperature at which gasoline gives off enough vapor to ignite in the air, is only 45º F. Gasoline can also easily ignite from a spark. If temperatures exceed 495º F, gasoline will auto-ignite. Other vehicle fluid leaks may also result in a fire, as just about every vehicle fluid is flammable: oil, brake fluid, transmission fluid, power steering fluid and, yes, even engine coolant. Vehicle fires also frequently start as a result of defects in the electrical system. Battery fires and explosions can occur, particularly when a battery is charging. Defects in the ignition system may create sparks that ignite leaking fluids or fuel. Vehicle fires may also result from design defects, neglect of vehicle maintenance, collisions, or an overheated engine or catalytic converter. These issues can be interrelated. For example, a design defect may cause an engine to overheat, as can maintenance neglect resulting in defective seals or a radiator malfunction. 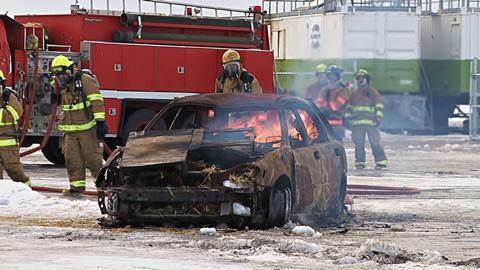 In some cases it's not difficult to determine that a vehicle fire was intentionally set. For example, a vehicle may be found, burned and abandoned in a remote location off of the main road. The owner's story is that the car was stolen and that they have no idea of who took the car or how it came to be burned. As suspicious as an insurance company may be of the owner, it's not particularly unusual for amateur car thieves or joyriders to burn a vehicle to try to cover up their crime. It can thus be very difficult to determine if the case involves an actual theft or insurance fraud by the owner. An accelerant is a flammable substance such as gasoline or lighter fluid that is used to accelerate the growth of a fire. As a fire within an enclosed space will rise toward the roof and consume the available oxygen, after a passenger compartment fire it may be possible to find on the floor of the vehicle the presence of an accelerant suggesting or establishing that the vehicle fire was intentionally set. While some arsonists may be sophisticated enough in their technique to make the fire look accidental even when the fire is extinguished quickly and the vehicle largely preserved, most people lack that level of sophistication. At the same time, unless there is a rapid response from the fire department, the evidence of arson can be largely or completely consumed by fire by the time the fire is extinguished. Where a vehicle is alleged to have been stolen, even in a severely burned car it may be possible to find evidence - such as the owner's keys-- that undermine the claim of theft. If a vehicle was stolen and used in a crime before being abandoned and burned, a particularly thorough investigation of the vehicle is warranted in the interest of trying to identify and prosecute the professional criminals behind the crimes. A vehicle fire examination will normally involve an examination of the location of the burned vehicle, with the preparation of a diagram and the taking of photographs to document the location of the vehicle and its condition after the fire, including the presence and condition of any cargo, and any debris or burn marks in the area around the vehicle. The fire investigator will collect information about the vehicle and fire, including the year, make, model and mileage of the vehicle, the vehicle's service record, whether the vehicle was in use when the fire started, whether the vehicle exhibited any unusual problems prior to the fire, information about efforts to extinguish the fire, and the statements of witnesses to the fire. The fire investigator will try to identify possible sources of the fire, and to trace how the fire spread through the vehicle. As the investigation continues, the vehicle may be partially disassembled in order to try to find more evidence of the cause of the fire and the path of its spread.